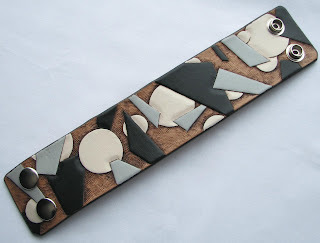 I just finished posting a slew of new wristbands to my online shops. 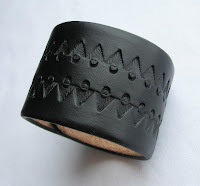 Everything from basic black tooled bands to brightly colored fun cuffs! 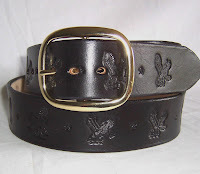 Made of heavy belt leather, these bands will last for many years. They'll get wonderfully limber as they break in, becoming the thing you most want to have on your wrist! 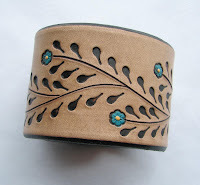 I've even thrown in an art cuff with an original design. Prices on these start as low as 12.00! Visit my Etsy shop for the full assortment -- some are up at Art Fire as well. Both shops are linked on the left. Tooling leather comes naked. No color, no finishes. 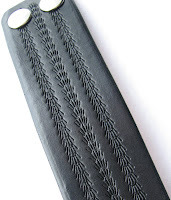 It's essential to the process of tooling, as the leather has to be able to absorb water freely and evenly and any dyes or finishes impair that ability. 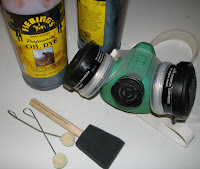 Dyes and color come after all the tooling is done and there are a variety of products and tools for getting naked leather dressed up. I have my favorites -- the ones I find most faithful after years of trial and error. 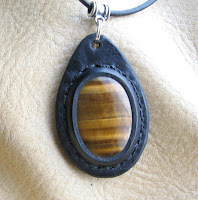 For making leather black or brown I prefer a penetrating oil-based dye. 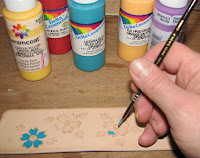 It gives superior color and evenness, and the colors do not have a tendency to bleed or rub off. This dye has very hazardous fumes; it's combustible and toxic, so adequate ventilation is essential to your health and well-being. If you don't have a strong exhaust fan specially rated for such things, then I recommend you dye outside whenever possible. If your yard is 3 feet deep in snow like mine, then open the windows and employ a fan and a protective mask. Seriously! Use gloves, too -- this dye will penetrate your skin as readily as leather. I like wool daubers for application on small projects. For larger items I prefer a sponge brush. I advise against an air-brush without a special set-up for exhausting the atomized combustible particles. I do 2 coats of color for complete coverage. It's finished off with an edge-coating, an application of a conditioner and a water-resistant beeswax finish. Sometimes black or brown won't complete the picture -- sometimes a bit of color is required! 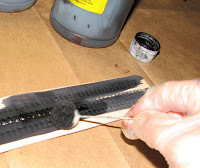 It mixes well, thins with water and applies easily with a brush. It has no toxic fumes, which is nice! 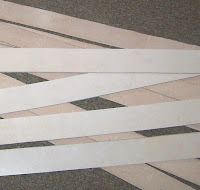 Once it dries completely a protective edge-coat is run around the outer beveled edge. Then a highlighting product is applied generously, taking care to work it into the impressions. Once the excess is wiped away, the remaining highlighter mellows the background and makes the detail pop! 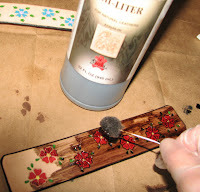 To finish my colored leather I use a coat of conditioner and then a spray silicon sealant. Don't you just love color? Want Winter? We've Got Some! It has been a winter for the record books in Michigan. This morning I woke to a temperature of 15 below zero Fahrenheit -- that's negative 26 in Celsius -- very cold, and that's not even the coldest temp we've had this year. 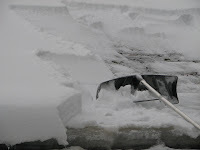 Snow has fallen more days than not, leading to way too many days of raking my roof for my liking! Frozen pipes, frozen drains, excessive heating costs, dangerous driving -- all have been a part of a beautiful but intense season this year, all are expected when you live up here in the north land. There are other problems that come with an extra strong winter, though, and those are not so expected. Earlier this month there was a serious issue in many parts of the state with river ice-dams causing flooding. Difficult enough to have your home flood -- almost unimaginable when the flood freezes. My friend Kevin, who lives in the Grand Rapids area near the Grand River, sent me some pictures yesterday that I just had to share! The river has receded from its height of 9 feet above normal levels, and he took his truck and his camera down to the Grand to capture these images. Note the chunks of ice still clinging to the trees -- this is where the water line was before the ice jams broke loose and the water flowed away. In the shot with his truck those ice remnants are high enough that if he'd been parked there 2 weeks ago, his truck would have been submerged! My sympathy to all who were affected, and my thanks to Kevin for sharing his pictures and giving me permission to post them! "I Have a Dream" - "Yes We Can"
In 1963 I was but a child. Still, I remember. 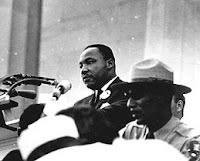 The Reverend Dr. Martin Luther King Jr. was in Detroit, marching down Woodward Avenue with a contingent of Civil Rights advocates and regular citizens. It was a time of great movement in the world; JFK was President and the merging of politics and the Civil Rights movement was indisputable in America. Dr. King gave a great speech in Detroit in June, and in August on the steps of the Lincoln Memorial in Washington DC that speech was expanded and permanently imprinted in the minds of generations. The words "I Have a Dream" became a rallying cry and an anthem for a nation's drive toward a more perfect Union. The struggles were horrific. Within months we lost President Kennedy. Within just a few years his brother Bobby and Dr. King were also gone. There were race riots in the streets. My family lived in the suburbs northwest of the Motor City and I recall watching the National Guard and US Army tanks moving down I-75 on their way to quell the riots that tore up large areas of Detroit in 1967; some of that damage is still visible in the hardest-hit parts of the city. Tanks and machine guns, used inside of American borders by American troops against American citizens. Against people of color. Yes, the struggles were horrific. While it may be true that the struggles are not yet over and that we are not yet living in that perfect Union, we find ourselves on the eve of such a large victory that I find euphoria difficult to contain. Here, on the official day set aside to honor Dr. King, we are on the eve of an historic inauguration. Barack Obama is not simply the first African American to be elected President, he is, in the words of General Colin Powell, "a transformative" figure in American politics. With a grace and strength that promises to unite people across many divides, he has awakened in me a spark that had long been buried under the cynicism of one who had watched many of her heroes taken away too soon. He has brought America to a place where we believe that, "Yes, we can!" Dr. King's dream is at last coming true. Thank God Almighty, true at last! Here they are -- the new stones I was crowing about last week. They turned out nicely, I think! 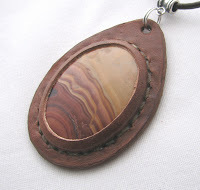 First is a fabulous piece of Flint from Ohio -- I learned a lot when I looked up the info on this stone. Flint is the official Gemstone of Ohio. It was used widely by Native Americans for not just arrowheads and spear points, but also for jewelry and sacred pipes. And color! Oh My!! My previously-held notion that flint is a gray or black rock of little interest was absolutely blown out of the water by this lovely specimen! Next is a very striking piece of Picture Dolomite from Mexico. I've become very fond of dolomite in a number of varieties. It's an ancient rock, with every specimen a minimum of 2.2 billion years old. The Earth is about 4.5 billion years old, making this fossilized algae half as old as the planet itself! Too cool! 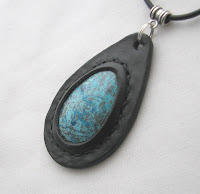 I also did up this pretty bit of African Turquoise jasper -- not turquoise at all, of course, except in color. The black leather setting sets it off perfectly! 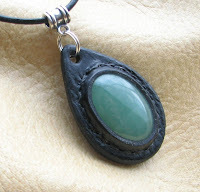 The last one is already gone, sold before it was done to my most devoted Earth Medallion customer. 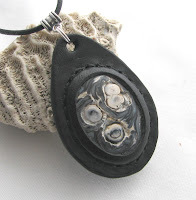 It's Botryoidal Chalcedony, a very dramatic rock in black & white with swirls and dips; perfect for the dear lady who will be wearing it! The ones that made it to Etsy have more info in the listings. These turned out so well that I am fired up to do more. Ah yes, back to work with me!! There are many people who are much better at this blogging thing than I am -- they post more regularly and have interesting things to show & tell. Charity of the SubEarthen Cottage blog would be a case in point... she has a charming blog, nicely laid out and well displayed! She has started a lovely practice of featuring fellow Etsy artisans on her blog, and I am very flattered to be her first choice! Thank you Charity, for your awesome community spirit and for choosing my shop to feature! Well, here it is; the end of my belt supply. 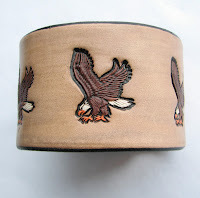 As I said in a prior post, I've made the decision to discontinue my in-stock belts for the time being so I can concentrate on other aspects of my inventory, namely my Earth Medallions. Though it wasn't an easy decision, I feel pretty solid about it. 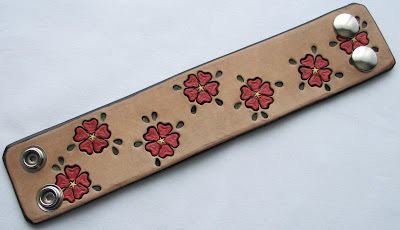 I am comforted by the fact that there are many other very talented folks on Etsy offering handcrafted belts. There are still a few left and they've been discounted to move, but by January 15th they'll be gone! Any that remain in stock at that time will be pulled from my listings, so if you want one before they're gone, this is the time to jump! 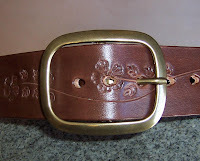 I will still take belt orders on a custom basis -- just contact me if you need one done to suit you. Wow! 2009. I'm excited about this new year. There are wonderful things on the horizon and I am full of hope! 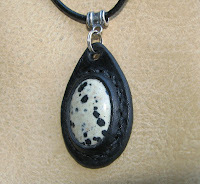 I went to Nawbin today (my favorite local bead & rock shop) and picked up some fabulous stones for my Earth Medallions. Look for some beauties next week! I got some more dolomite -- I love this stone! It's an ancient rock -- one of the oldest on the planet. You can read about it in the descriptions on the Etsy listings. I got a stunning piece of chalcedony in a dramatic black & white and some multi-colored Flint from Ohio (very pretty) plus a sweet piece of African "Turquoise", which is actually a form of Jasper. I have already started working them, but since the process takes a few days it will be a test of patience before I can show them off! As I've already stated, that's a virtue I have trouble with, lol. 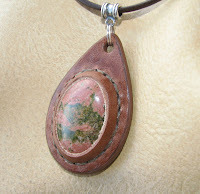 Some Unakite, which is one of my most popular rocks, as well as a new Tiger Eye, also a very favored stone. There is a gorgeous piece of Aventurine -- so green and lovely -- and a sweet little pendant of Dalmatian Jasper which is very aptly named! There are more, of course -- don't want to give everything away on the blog! You can find them in my Etsy shop! 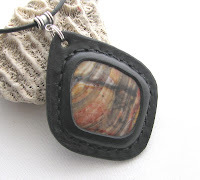 I am having so much fun making these, and I am so very grateful for the chance to continue playing with leather & stones!! I hope everyone has a fabulous 2009 -- Happy New Year!